Ed. 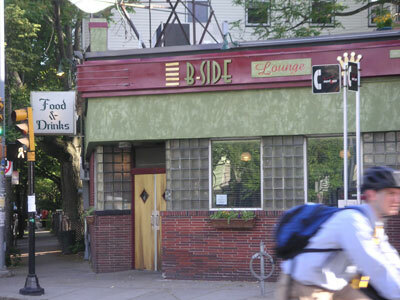 Note: The B-Side Lounge closed in 2008. Atmosphere: Hip but not painfully so. Retro but not kitschy. Crowded. B-Side opened at the tail end of the widespread, short-lived revival of cocktail culture, a la the Rat Pack, that the movie Swingers ushered in. Fortunately, the cocktails themselves stuck around, and so did B-Side. That’s because owner/bartender Patrick Sullivan did something revolutionary: he offered vintage cocktails. And he offered them right, with crushed ice, fresh citrus juice, and long-ignored ingredients like Benedictine liqueur and rye whiskey. The drink menu — probably the most comprehensive in greater Boston — categorizes cocktails by their base liquor, e.g. “Whiskey Base,” “Gin Base,” etc. It includes classy stuff like the Frisco (rye whiskey, Benedictine, lemon juice) and the Champs Elysees (brandy, yellow Chartreuse, lemon juice and Angostura bitters), plus drinks like the Double Wide (Coke syrup and Jack Daniels) and the Mullet (Bud Light and a shot of Sambuca) that clue you in to the fact that B-Side refuses to take itself too seriously. A cocktail can be a sublime thing, but it shouldn’t be a serious thing. This attitude comes through in the drink prices, which start at $8 (downright cheap for the Boston area). If you’re not into mixed drinks, B-Side’s got you covered with wine and a decent selection of (mostly) craft beers on tap, as well as macro and retro brews in bottles and cans. Several of the Boston area’s best bartenders — including a few profiled on this site — either work or have worked at B-Side. It’s the perfect place to hone one’s knowledge of mixology, not to mention crowd-control skills. The place is frequently packed. The bar staff looks professional (they wear long, white aprons, and the guys wear ties) but far from stodgy (body art seems to be a requirement). B-Side bartenders who move on to other gigs take that “I’m a professional but I’m having a good time” attitude with them. B-Side occupies the site of the former Windsor Tap (the building is located at the corner of Hampshire and Windsor streets), which was something of an East Cambridge institution. B-Side was initially resented by many WT regulars as one of those trendy, upstart establishments that signal the yuppie takeover of a working-class neighborhood. But its no-nonsense attitude ultimately endeared it to a wide range of drinking types. It helped that Sullivan fixed up some of the space’s best features: a large, U-shaped bar, pressed-tin ceiling, and thick glass tiles on the wall that let in light but mercifully shield customers from a view of the drab intersection outside. Vintage cocktail equipment and a plastic Bud Man (that’s a Budweiser spokes-character from the late 1960s/early 1970s, kids) share a perch above the back bar that houses the citrus juicer and the turntable. Yes, B-Side plays records when things aren’t too busy. Another big, big plus is that the food here is consistently good. I guess you’d call it “American-eclectic.” There are six or eight well executed entrees, most of which are around $20. People actually go to B-Side to have dinner! Don’t worry, if you’re saving all your money to pay the bar tab, look for the wire carousel and help yourself to a free hard-boiled egg. B-Side’s only real drawbacks are a lack of parking (but you shouldn’t be driving after hanging out there anyway) and the noise level, which can escalate painfully when the place fills up.